September's challenge: 30 days of Lists! So as one challenge ends (actually make that two: #31daysofpaper and #augustbreak2014 - both on Instagram) another starts. And this one is right up my street - as soon as I heard of it and found out more I knew I'd be taking part! It works in much the same way as the photo challenges with prompts for each day and is run by Kam of Campfire Chic and Amy of Lemon and Raspberry. 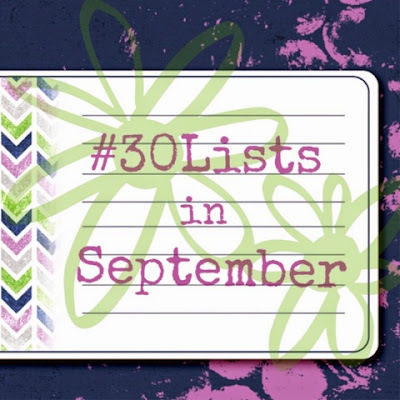 I'll be sharing my #30Lists using that hashtag on Instagram daily and Pinterest somehow (I'm not sure how yet) and a weekly round-up post on the blog. So expect to learn some new stuff about me, I'm expecting that too!